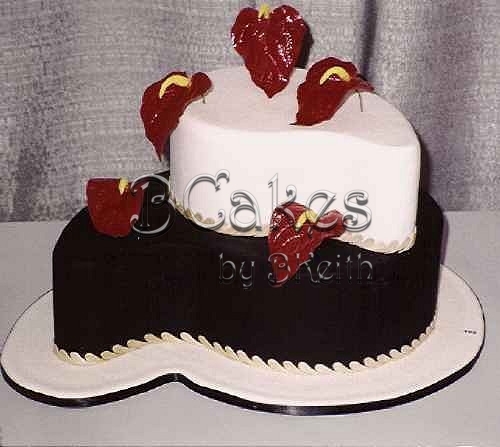 Price reflects an estimated cost per serving for a similar cake based on current pricing structure. 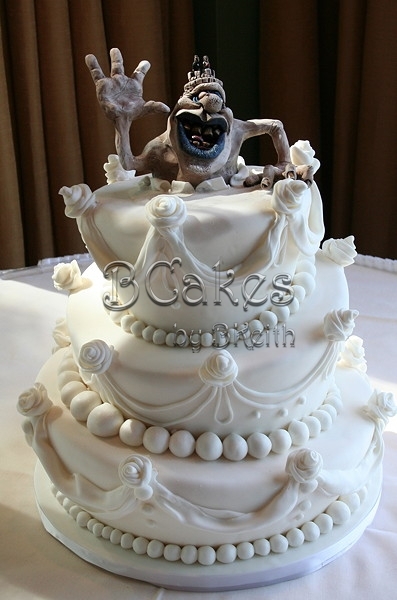 For more details and to discuss your specific needs, please contact BCakes. 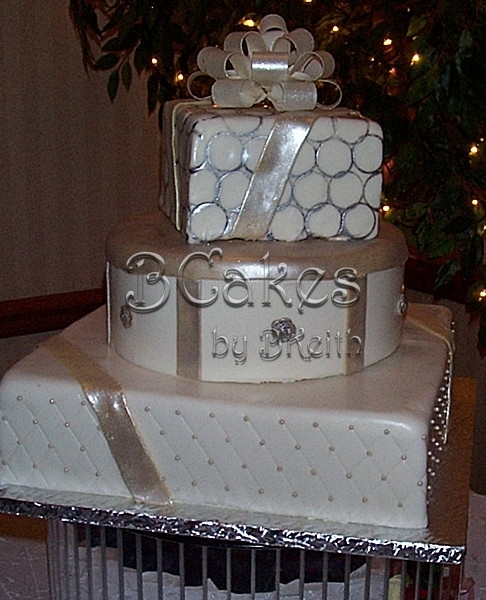 For a Christmastime wedding. Sugarpaste amaryllis, holly, and ivy invoke the holiday spirit. 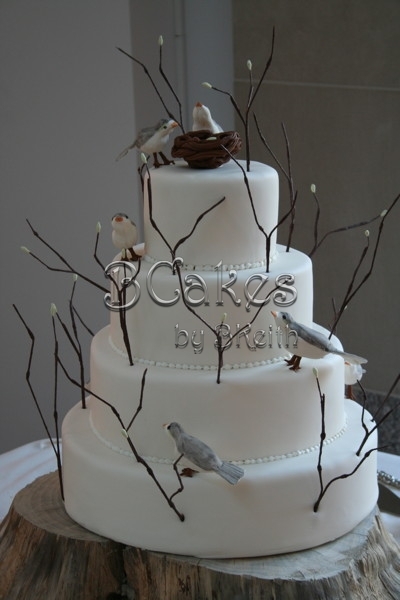 Hand-modeled sugarpaste birds and branches. 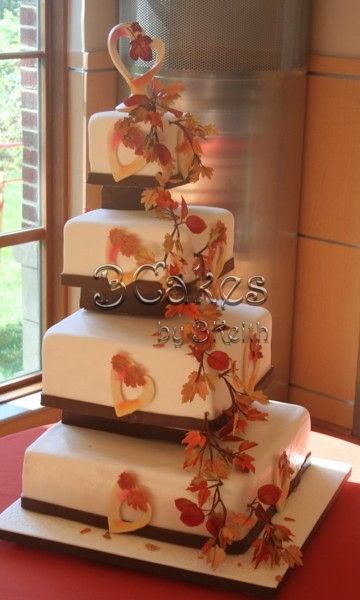 Tiers appear suspended in air with a cascade of sugarpaste fall leaves. 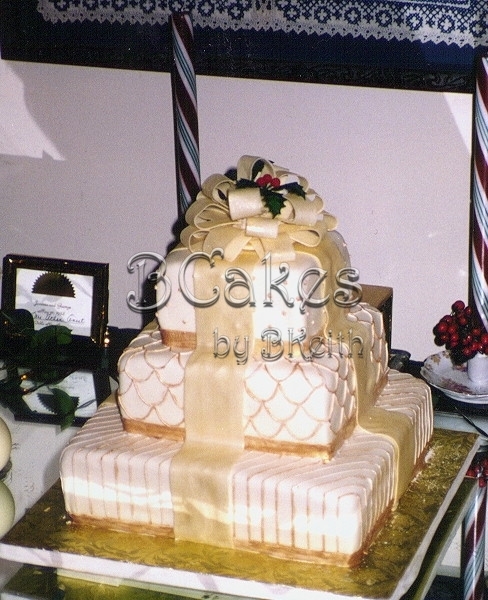 Springs of holly adorn a stack of elegant white and gold packages. 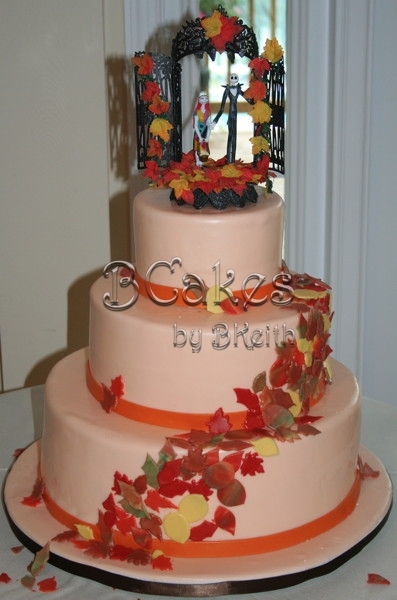 Cascade of falling leaves swirling around a simple, elegant cake. 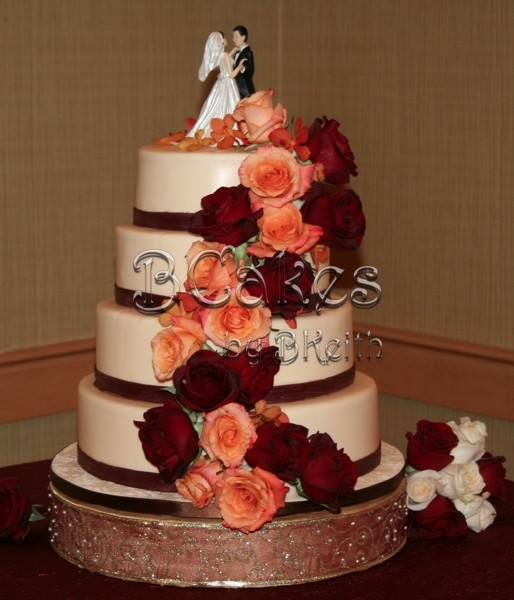 Cascade of fresh roses in fall colors set off an elegant display. 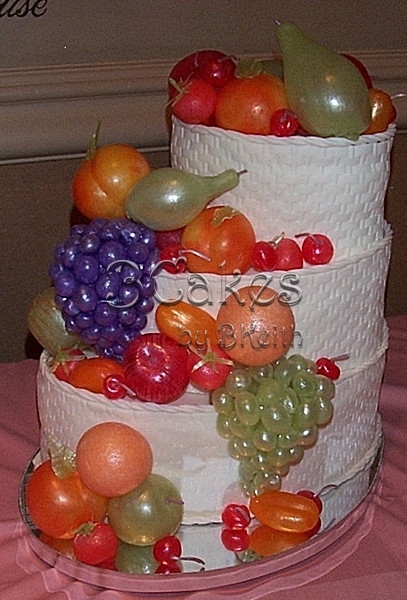 Hand-blown sugar fruits on a stack of cakes disguised as baskets. 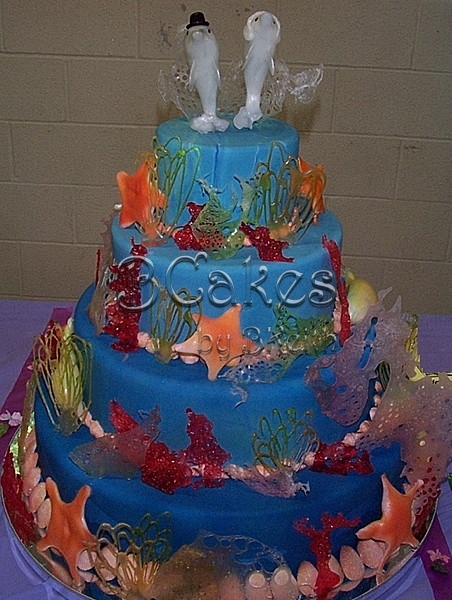 Under the sea with plants, starfish, and shells all made of sugar. 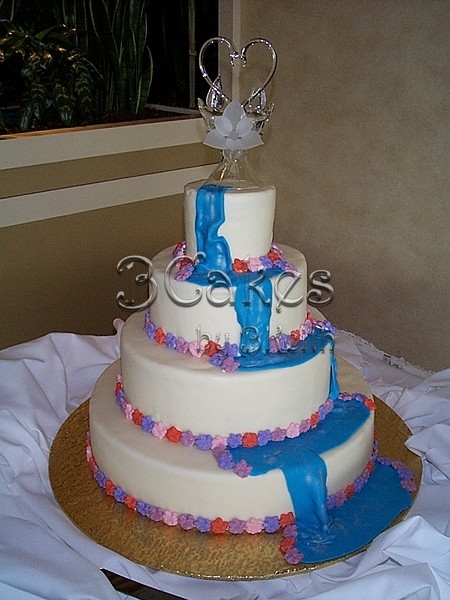 A handsome couple of blown sugar dolphins are the bride and groom. 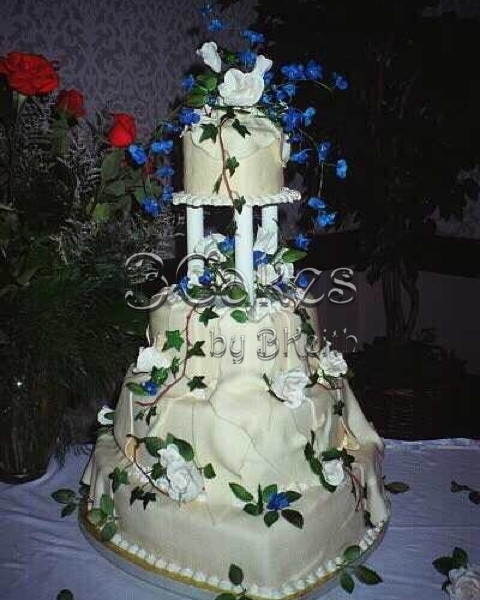 Elegant cake featuring state symbols of North Carolina: Dogwood, Carolina lilies, strawberries, and blueberries. 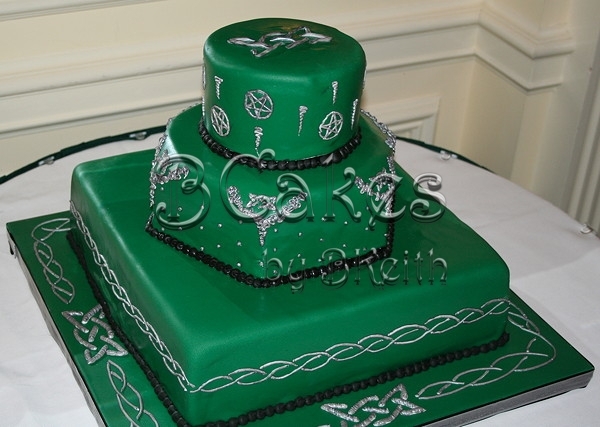 Celtic designs embellish a cake colored green for the Emerald Isle. 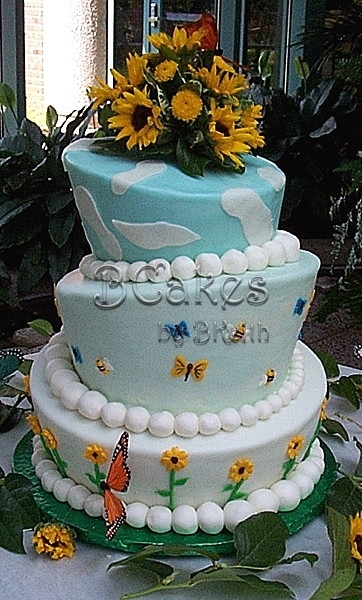 Sprays of sugarpaste tropical flowers top floating tiers. 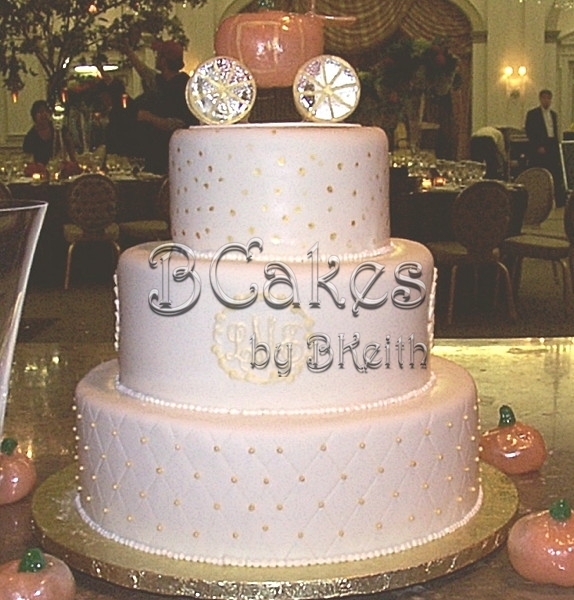 Blown sugar pumpkin carriage atop an elegant gold and white cake. 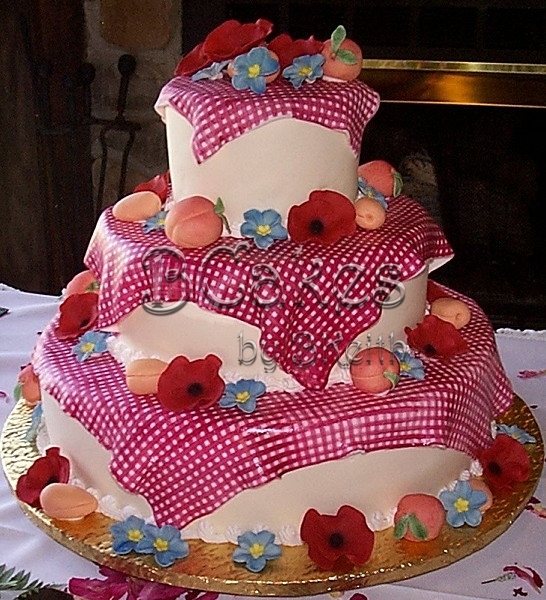 Gingham print on a sugarpaste tablecloths set off this country-themed cake. 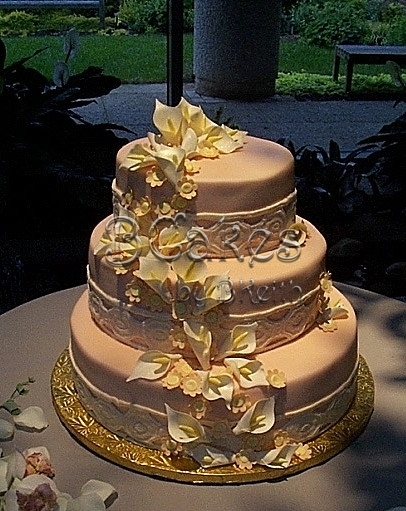 Sugar flowers and marzipan fruits complete the look. 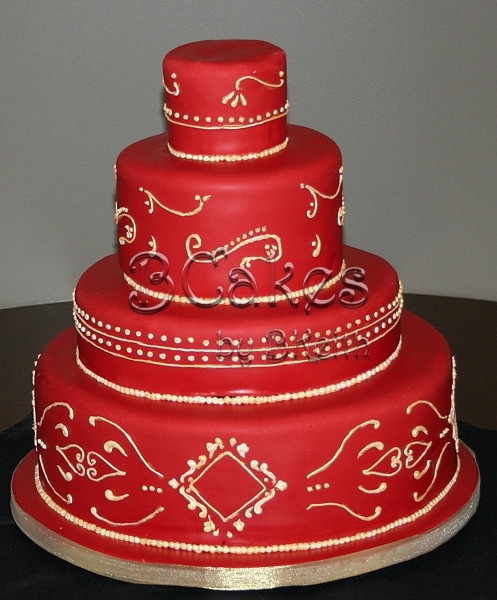 Gold scrollwork accents on an elegant red cake. Sugarpaste flowers, edible gems, sequins, and vase, and sugarpaste fabric form a stunning cake inspired by the bride's sari. 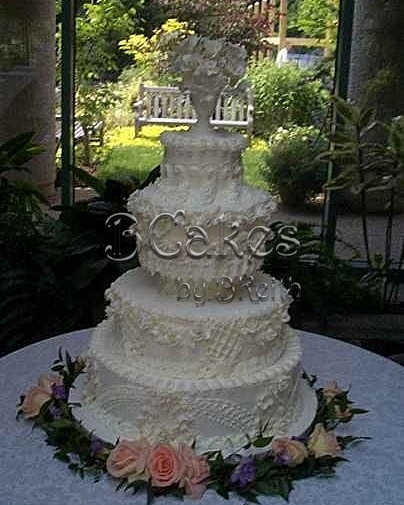 A waterfall of sugarpaste cascades town tiers ringed with spring flowers. 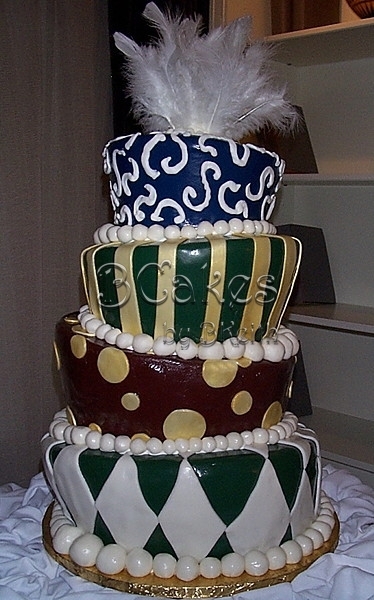 Whimsical yet elegant, real feathers top this topsy-turvy design. 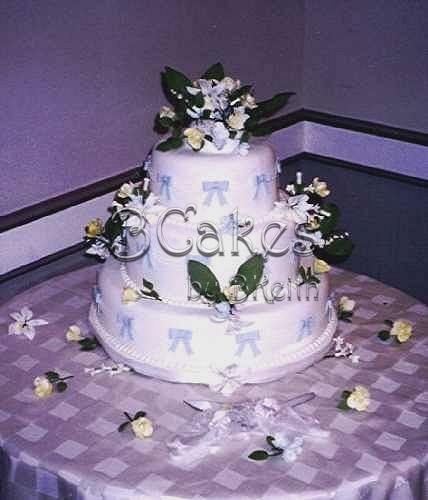 Bright, bold colors and festive fleurs-de-lis highlight this fun-loving bride's cake. Sunflowers and butterflies under a summer sky. 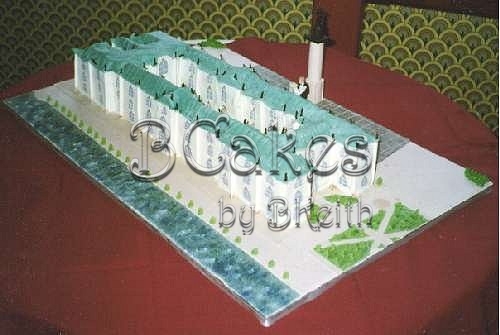 Made for a fun-loving couple to incorporate their interests. Can you spot the sugar bunny? 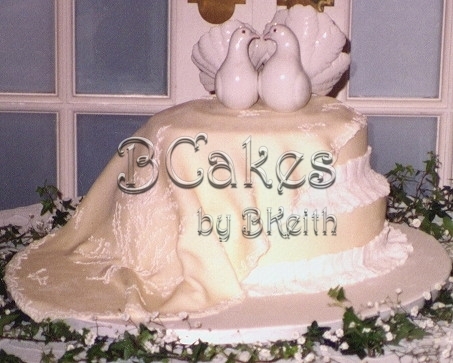 The bride's brother created the topper that's bursting free from traditional wedding cakes. Stack of packages to honor the bride's father, a professional box designer. 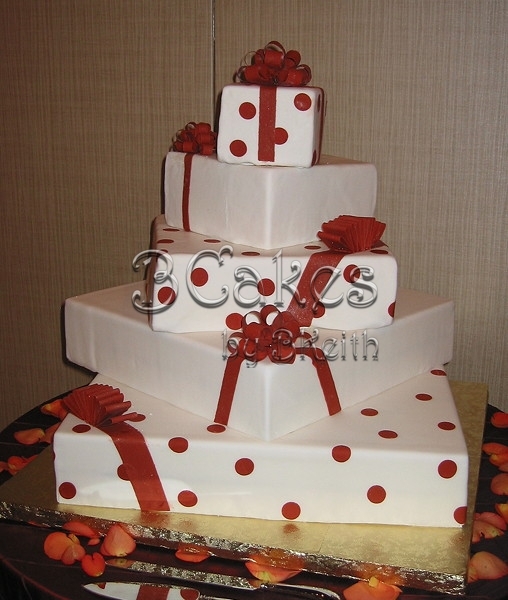 Stack of fanciful red and white packages. 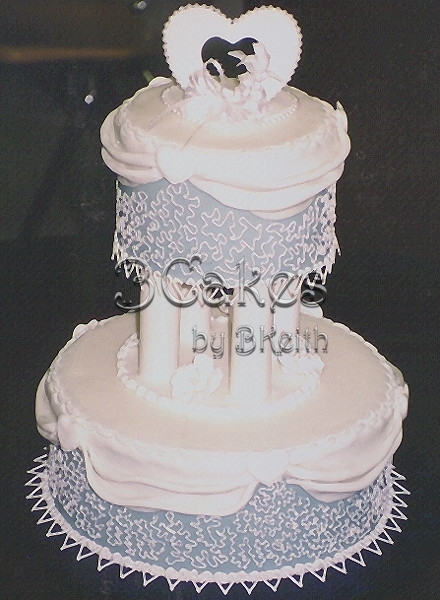 Sugarpaste lace copied the bride's dress trim, sugarpaste callalilies, and a perfect evening. 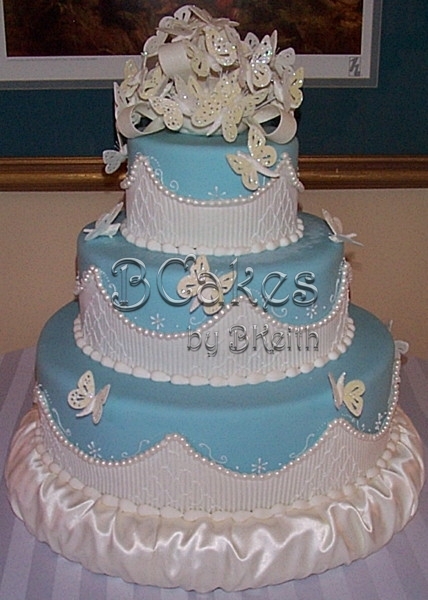 Delicate and elegant with sugarpaste smocking, pearls, ribbons, and butterflies. 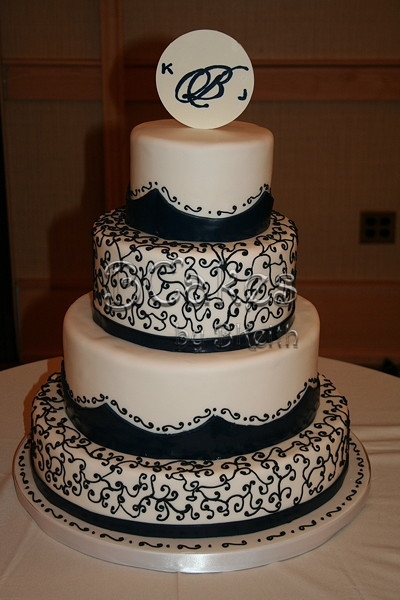 Piped scrollwork and scallops with a personalized monogram topper. 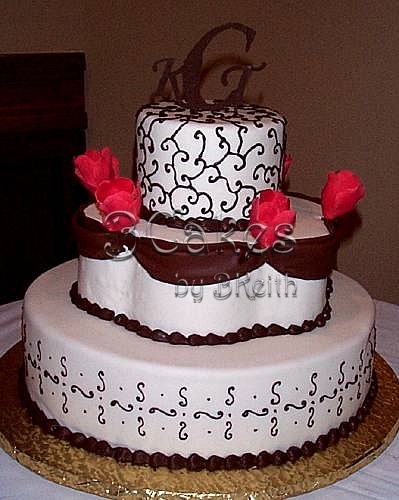 Chocolate piping, chocolate swags, sugar flowers, and a chocolate monogram topper. 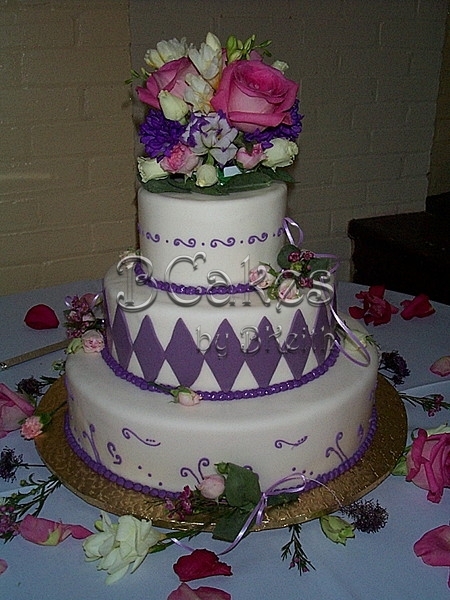 Piped lace, sugarpaste swags, sugar flowers, and a sugar topper. 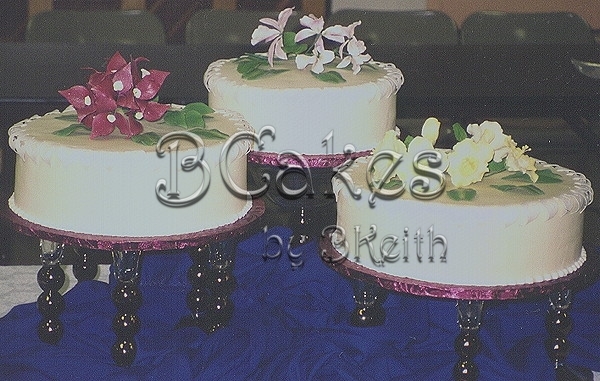 Piped lace, sugarpaste ribbon, and sugar cymbidium orchids. 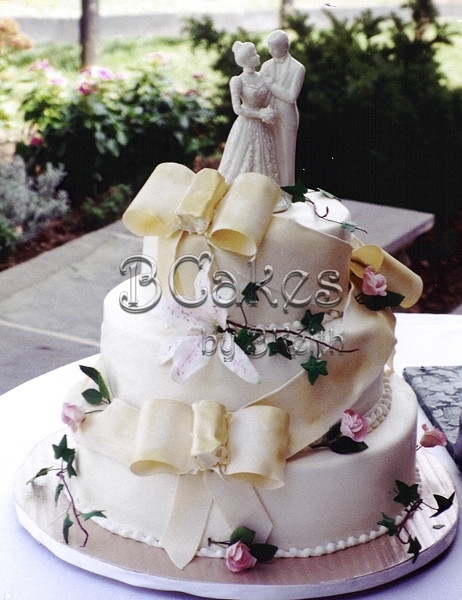 Sugar flowers and sugar bows make for an elegant and classic look. 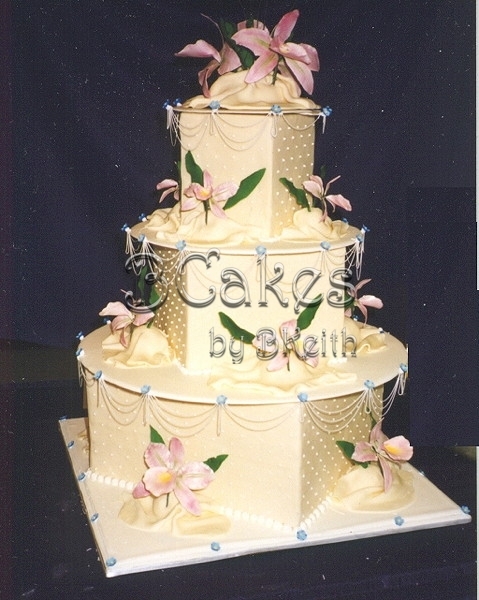 Sugar flowers and sugarpaste drapes. 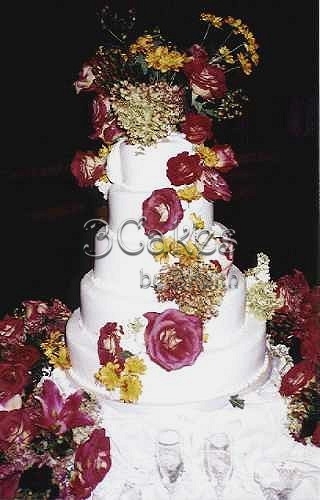 Fresh flower cascade down an elegantly simple stack of tiers. Sugarpaste flowers, bows and ribbons for a festive springtime look. 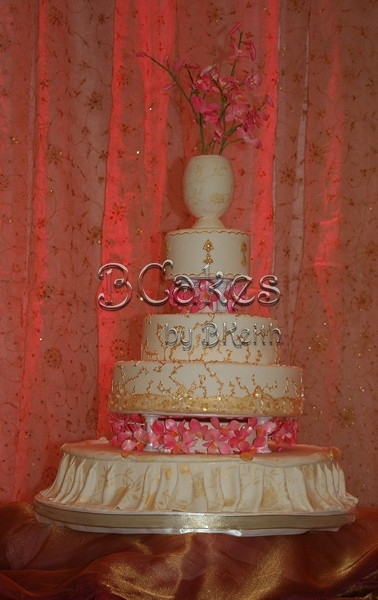 Sugar embroidery to match the bride's veil, and sugar lace to match her gown. 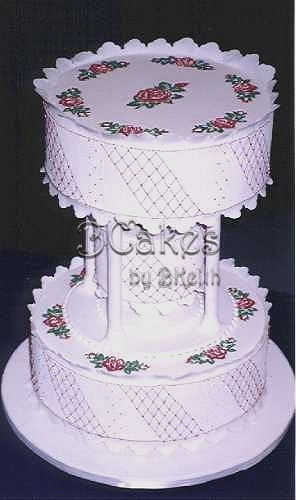 Delicate sugar smocking and embroidery bring traditional elements to a modern arrangement. 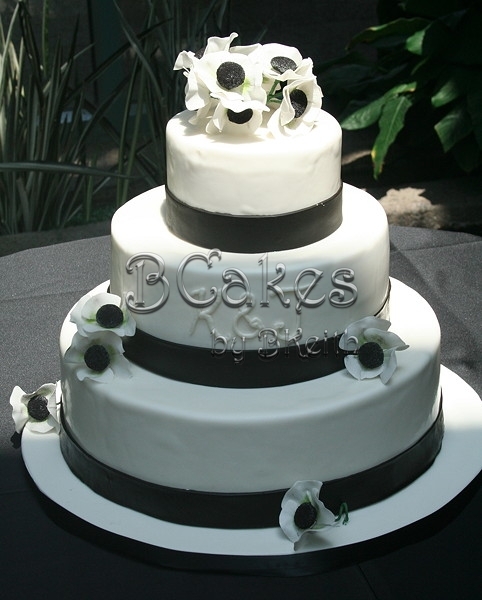 Sugar ribbon and sugar poppies make for a standout presentation in black and white. 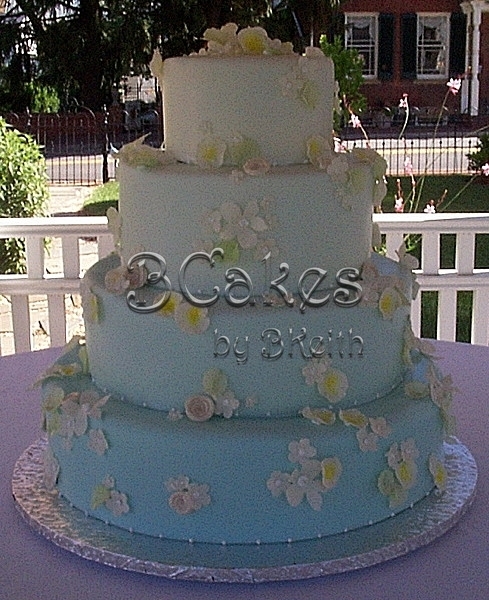 Graduated shades of blue with simple fantasy flowers. 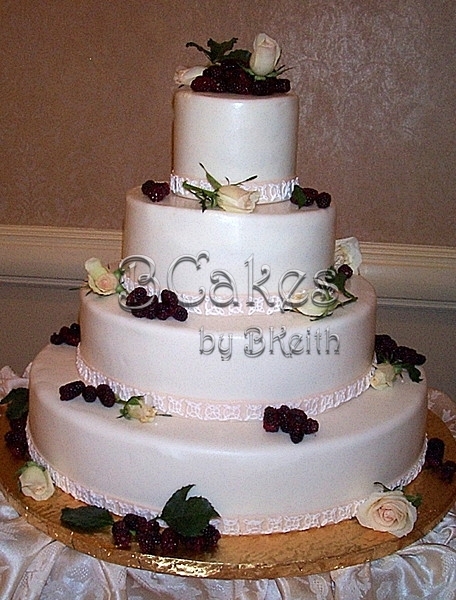 Fresh flowers and berries with a delicate piped Celtic border design. 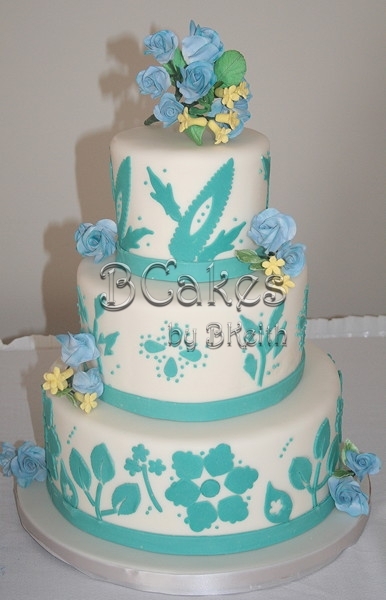 Hand-painted flowers and leaves on the cake and glass base make for a stunning display. 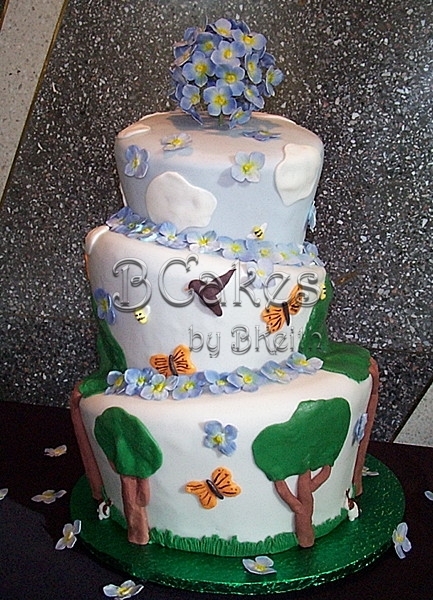 Sugar ribbons and flowers finish the look. 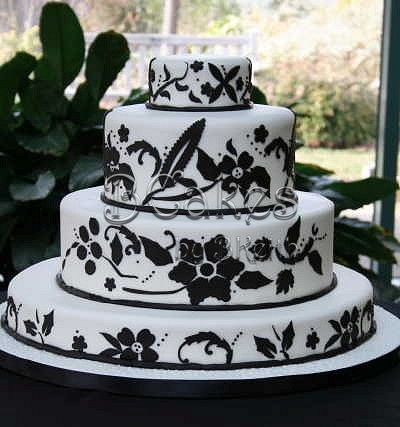 Hand-crafted black damask design makes for a stunning presentation. 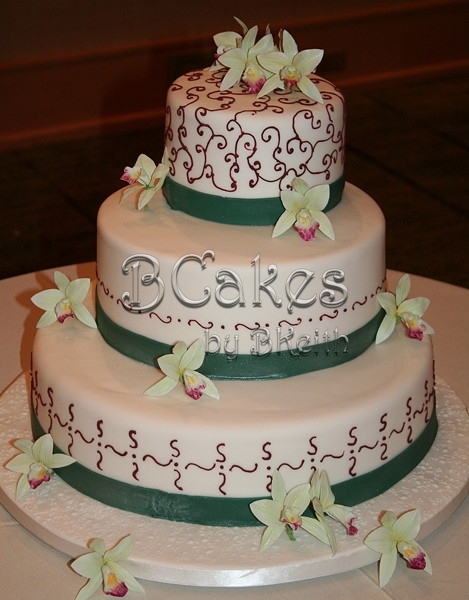 Another take on damask with sugarpaste flowers. 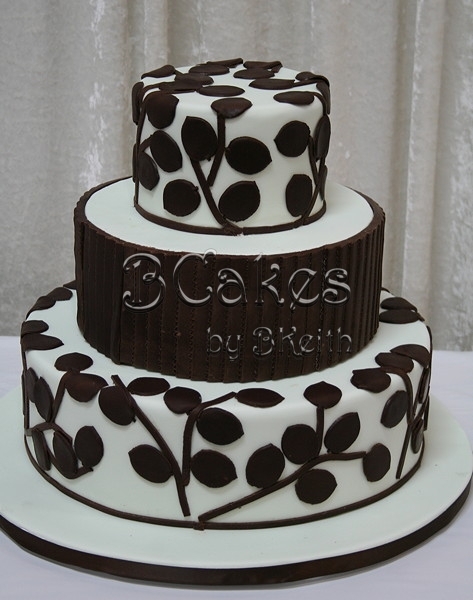 Chocolate leaves alternateing with a textured chocolate band. Modern and elegant. Elements of a favorite picture frame recreated in sugarpaste. 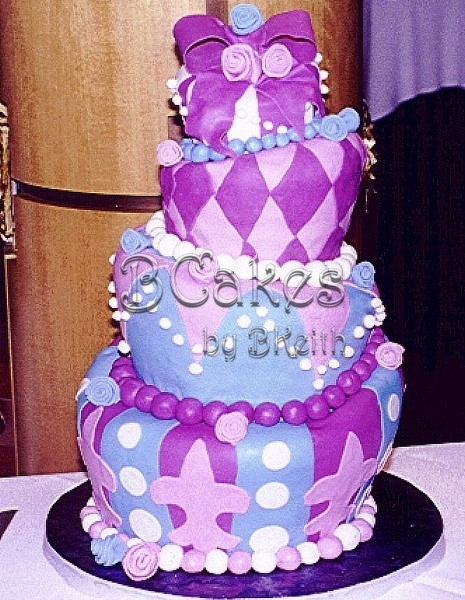 Piped scrollwork and sugarpaste diamonds make for a fancy look. 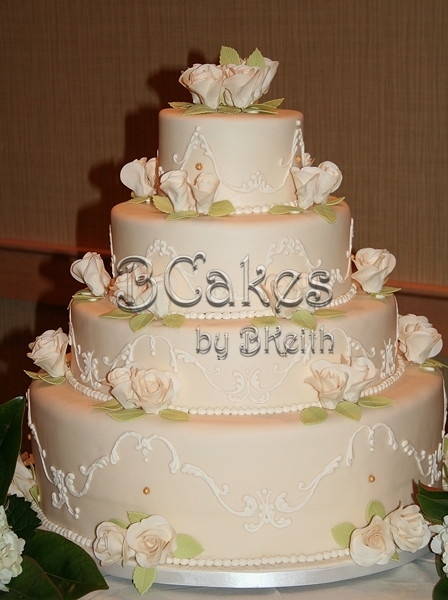 Delicate piped scrolls and tiny sugarpastes roses lend elegance. 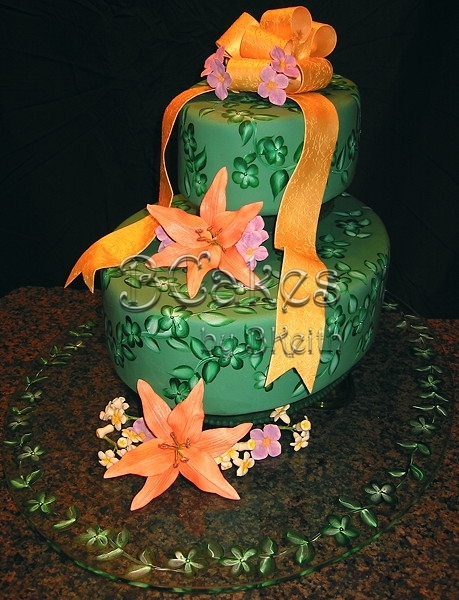 Sugarpaste orchids, sugar disks, and sugar strings turn square cakes into a fantasy. 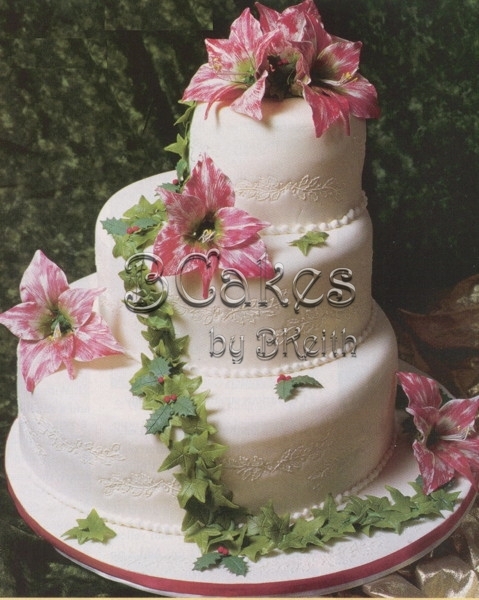 Red anthurium flowers on black and white cakes trimmed with gold. Stunning, elegant, modern. 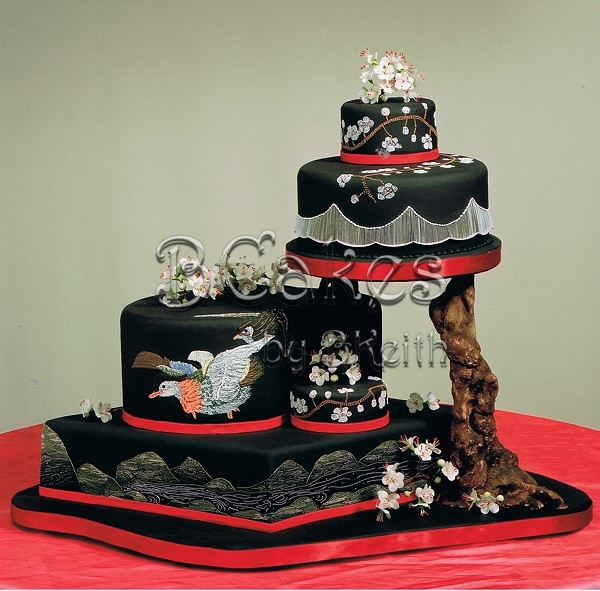 Intricate sugar embroidery, sugar sculpting, and sugarpaste flowers recreate a stunning wedding kimono. 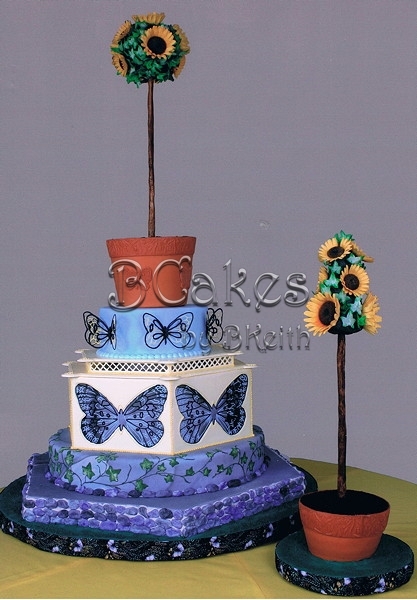 Delicate piped butterflies and a sugarpaste sunflower topiary celebrate summer. 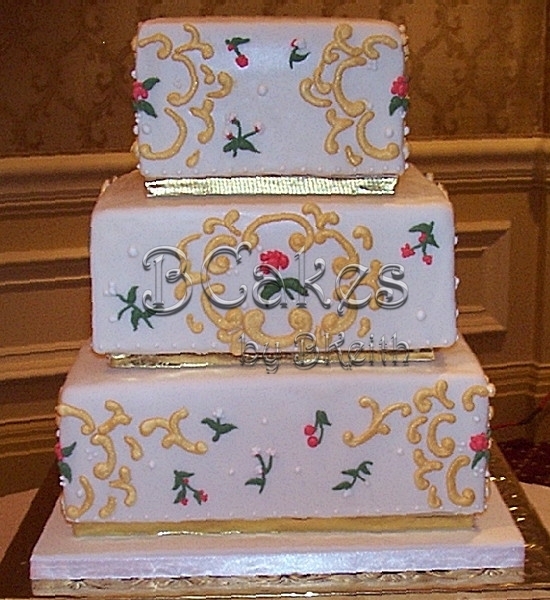 A stunning and ornate Edwardian design with layers and layers of detail. 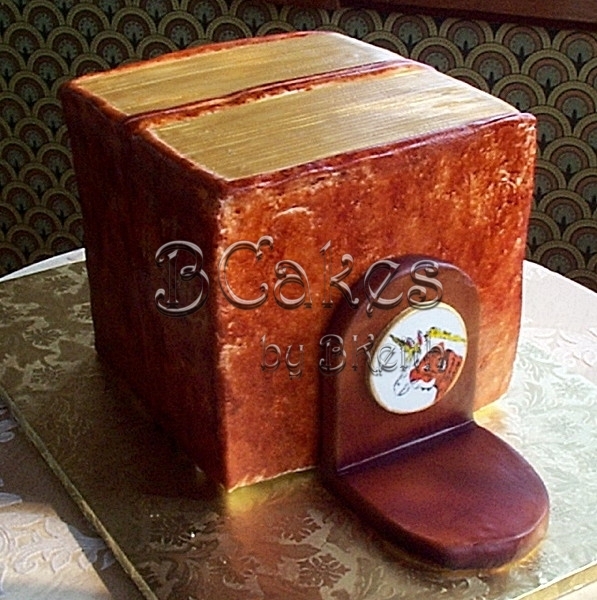 A wedding cake for book lovers. 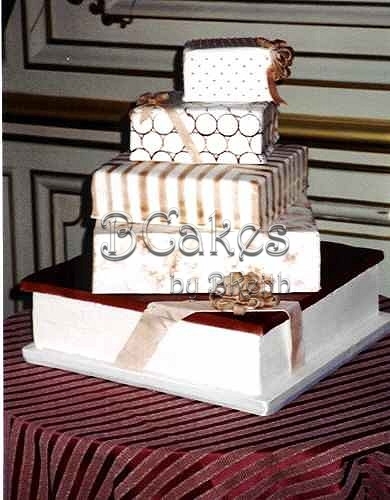 The bookend design is a re-creation of a drawing the groom made for the bride.